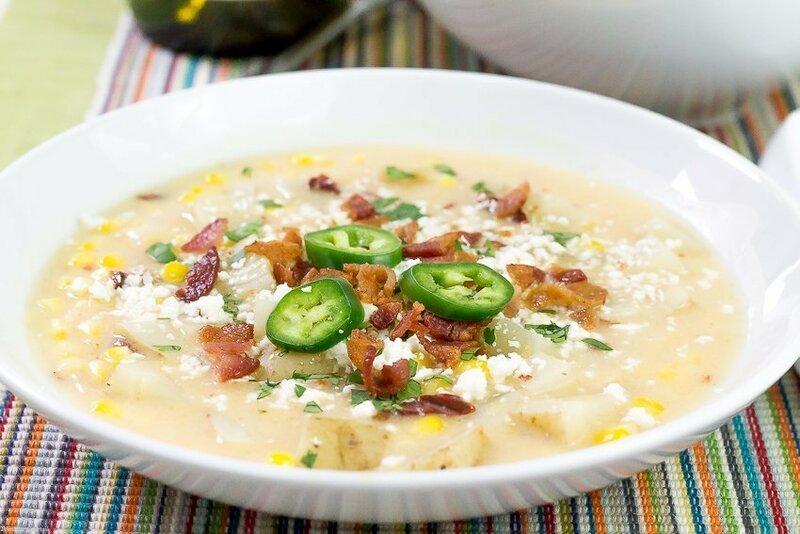 This spicy, creamy Chipotle Corn Chowder is full of seasonal vegetables in a light white wine broth. 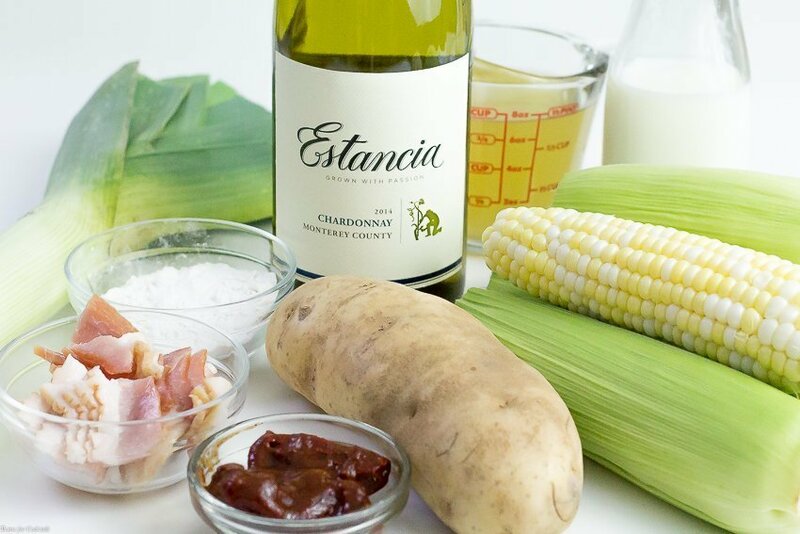 It’s hearty without being heavy making it the perfect late summer meal when paired with a simple salad and a glass of your favorite wine. This shop for Chipotle Corn Chowder has been compensated by Collective Bias, Inc. and its advertiser. All opinions are mine alone. #ArtofEntertaining #CollectiveBias The following content is intended for readers who are 21 or older. Paul and I need a vacation. A real life, get-out-of-town for a week vacation. We have had a few fantastic staycation weekends since getting married, but it doesn’t compare to the kind of relaxation you get from an extended stay away from the casa. A week on the beach in Mexico would be the honeymoon we haven’t had yet. After all the hard work we put into the last 3 years we deserve a blissful, sun-soaked toes in the sand celebration. Just thinking about the food makes my mouth water! And when the timing in right, we will go on that dream vacation. 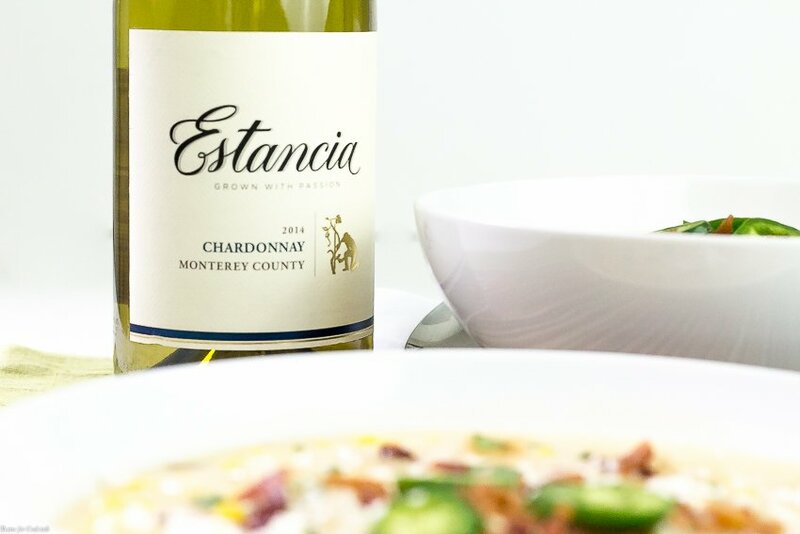 In the meantime we can spend an evening dining on Chipotle Corn Chowder and sipping Estancia Chardonnay to put us in a south-of-border vacay mood. 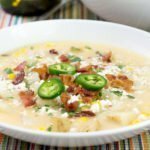 It was exactly what this simple, seasonal Chipotle Corn Chowder needed for an additional layer of flavor! 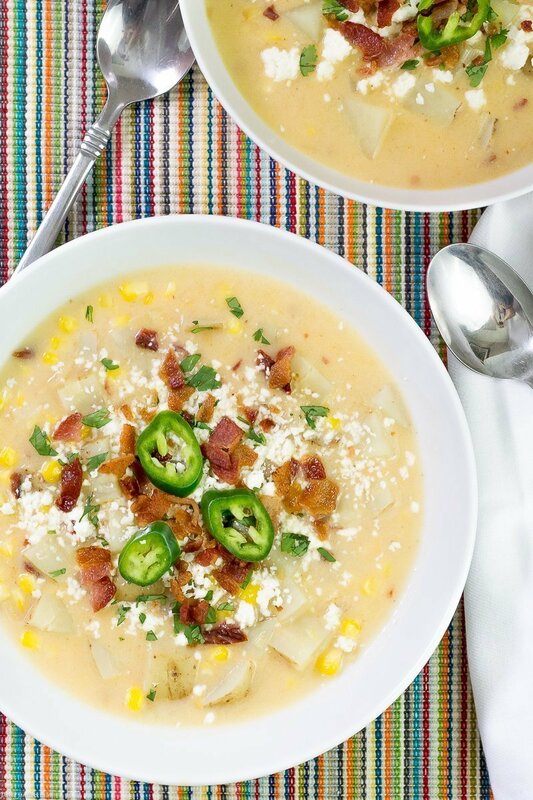 This spicy, creamy Chipotle Corn Chowder is full of seasonal vegetables in a light white wine broth. It's hearty without being heavy which makes it the perfect late summer meal. Heat a large Dutch oven over medium heat. Cook bacon until crispy, remove and set aside on a paper towel lined plate. Add butter, leeks and chipotle peppers to pan, cook 3 minutes. Lightly salt and pepper. Stir in flour, cook 1 minute. Stir in wine and stock. Add potatoes, bring to a low boil. Reduce heat and simmer 15 minutes. Stir in corn and half and half, simmer 5 minutes. Serve immediately with desired garnish. 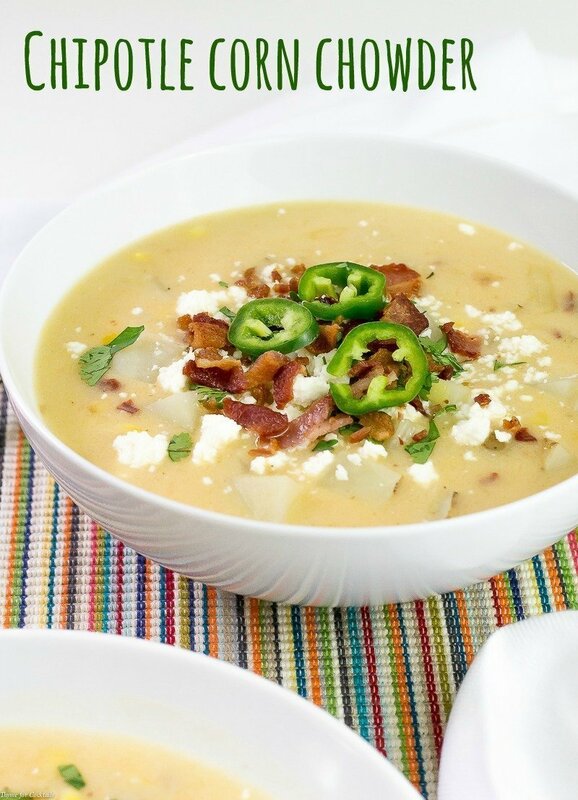 I hope you like this Chipotle Corn Chowder as much as we do! If you love this delicious seasonal soup recipe, you can find more like it by checking out my Soup section! For recipe inspiration delivered to your inbox, subscribe to my newsletter, follow my photography journey on Instagram, and for generally inappropriate humor follow like me on Facebook! I love chowders and soups but never put the two (soups/chowders and wine) together. Who knew?!!? Wine is good paired with anything. Bacon. Chipotle. Potatoes. What more could you ask for???? This looks delicious, can’t wait to try it and pair it with wine.